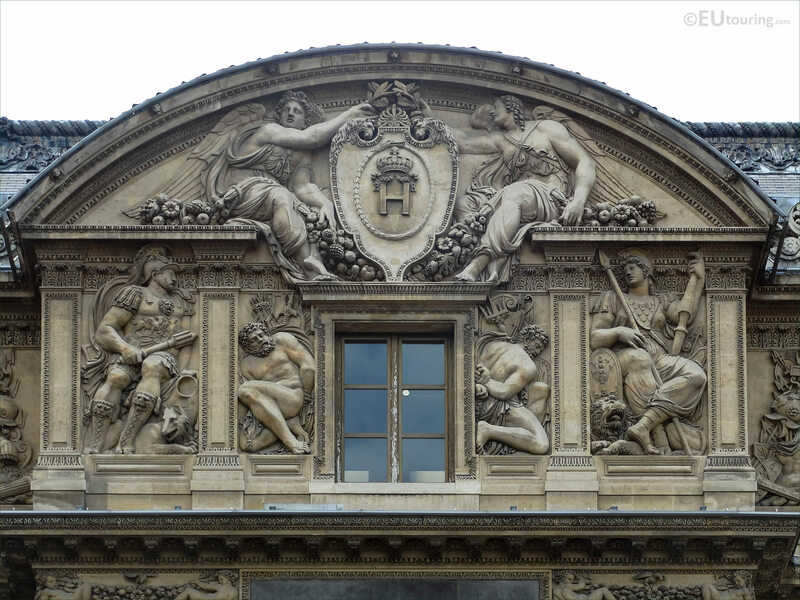 We were again in the 1st Arrondissement of Paris at the Musee du Louvre, when we took these high definition photos showing the Aile Lescot top pediment called Deux Victoires couronnant le chiffre du roi, which was sculpted by Jean Goujon. The Aile Lescot is a very historical section of the Palais du Louvre, and it was between the years 1556 and 1559 that the sculpture group on the main central pediment you can see in this first HD photo, was sculpted to depict two allegorical statues of victory crowning the King. Now at the time, it was King Henri II who was King of France, and the emblem you can see within the shield in the centre was actually the royal monogram for King Henri II, who unfortunately died as a result of a wound he suffered in a jousting competition. 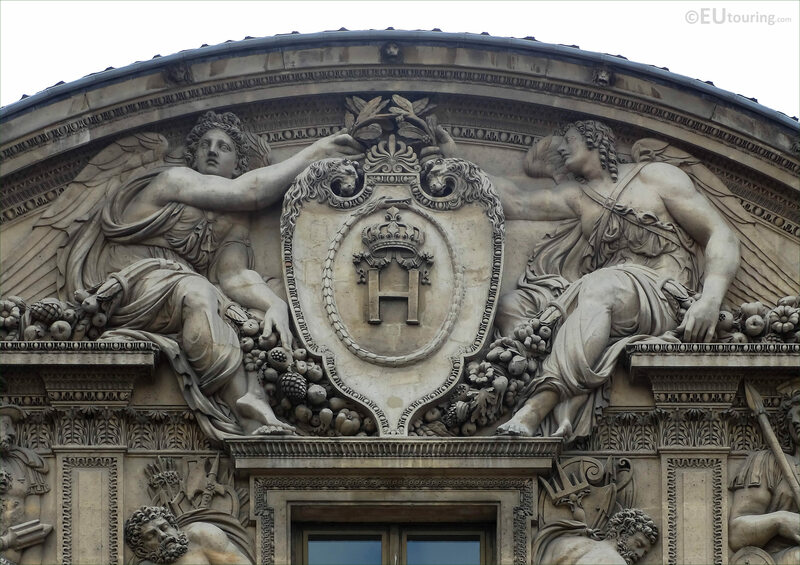 Yet here you can see a close up of the pediment, which is called Deux Victoires couronnant le chiffre du roi and this was sculpted by Jean Goujon, who is believed to have been born in Normandy around 1510, although exact details are unknown. However, Jean Goujon is mentioned at different times whilst working on sculptures and statues for places such as the Eglise Saint Germain l'Auxerrois and the Fontaine des Innocents, before then being mentioned as the sculptor for The Louvre between the years of 1556 and 1562. Yet he travelled to Italy towards the end of 1562 and was mentioned as working in Bologna in 1563 and the beginning of 1564, yet there is no trace of Jean Goujon after this, so even his year of death is unknown. 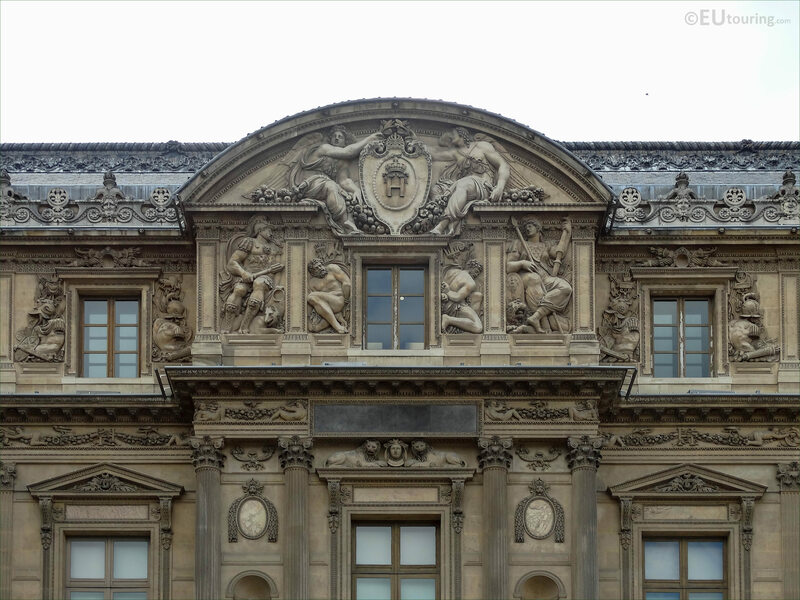 But here you can see a part of the Aile Lescot facade with the pediment of the Victories crowning the King, which is in the centre of this wing, and you would need to be in the courtyard called the Cour Carree in order to see this ornate architectural scene on the attic section.